Wouldn’t it be nice to be able to make money off your blog without running a single banner ad? 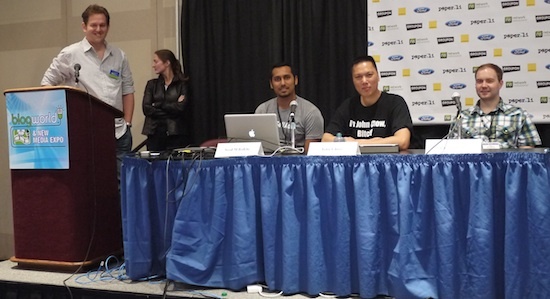 Well, if you were at my panel session at BlogWorld Expo in New York, then you would have learned how it’s done. The session featured myself, Zac Johnson and Syed balkhi. The panel was moderated by David Risley. Zac, Syed and I shared our experience with monetization methods that does not involve the banner ads. Most bloggers think that the only way a blog makes money is by banner advertising. This is so far from the truth. The banner ads on my blog accounts for only 1/3 of my blog income. We had a nice turn out for our panel and the audience asked a lot of great question. Hopefully, BlogWorld will make the session recording available soon. In the mean time, check this the great introduction David gave us. Unlike the other sessions, our’s is fun and off the wall.